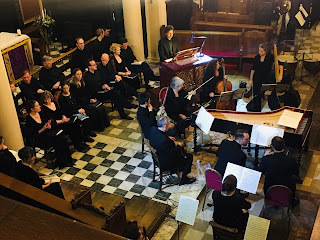 A highlight of the Tunbridge Wells International Music Festival this year is the concert at King Charles by Ensemble Frisson, with Karen Jones (whose fabulous flute playing was chosen for the Harry Potter films and May’s royal wedding), Ann Beilby (viola) and Hugh Webb (harp). Their enchanting programme includes music by Debussy, Bax, Richard Rodney Bennett and others. Hugh Webb studied with Renata Scheffel-Stein, Sioned Williams and Susan Drake. He has worked extensively in the contemporary music field and Javier Alvarez, Robert Keely and Ian Dearden have all written solo works for him with funding from the Arts Council of England. Hugh’s CD recordings include Bax’s Concerto for Flute, Oboe, Harp and String Quartet with the Academy of St Martin’s Chamber Ensemble (Chandos); a collection of French music for flute and harp; Villa Lobos’s Quartet (Clarinet Classics); and Bax’s Fantasy Sonata (Koch International). He gave the first performance of Cyril Scott’s Celtic Rhapsody as part of Sidonie Goossens’ 100th Birthday Celebrations at the Wigmore Hall. Hugh Webb also plays jazz on the harp and has given recitals at the European Harp Symposium and the World Harp Congress. He is active in the commercial world of television, film and popular music, devised a children’s show which toured very successfully in 1998 and has written music for a version of The Snow Queen. He has given many masterclasses and has lectured at London’s Royal Academy of Music, the Paris Conservatoire, the Sweelinck Conservatoire in Amsterdam and with Telynor Morgannwg in Wales. Australian violist Ann Beilby made her solo debut in the Sydney Opera house aged 19. She has since won many awards and prizes, both as a solo and as a chamber musician, including the Schott & Co Publishing Prize at the 2006 Lionel Tertis International Viola Competition, and the Cecil Aronowitz, Lionel Tertis and Lesley Alexander Prizes at the RCM (2009). Annie was also a finalist in the RCM String Player of the Year Award in 2009, and joint winner of the 2007 RCM Autumn Concerto Competition String section. Having graduated from the Royal College of Music’s MMus programme with Distinction in 2010, Annie now enjoys a rich and varied musical life freelancing with the leading London symphony and chamber orchestras. She is eternally grateful for the support of here mentors Guenter Pichler, Alex Todicescu (Sydney Conservatorium of Music) and Ian Jewel (RCM, London), as well as the Worshipful Company of Musicians in London; the Musicians Benevolent Fund; the Leverhulme Trust; the Richard Carne Trust; the Meyer Foundation; the Escuela Superior de Musica Reina Sofia; the Australian Music Foundation; and the Royal College of Music. She plays on a wonderful modern viola made for her in 2011 by David Milward. Karen Jones studied at the Guildhall School of Music and Drama with Peter Lloyd and subsequently won a Fulbright Scholarship and Harkness Fellowship to study in Vienna with Wolfgang Schulz and in New York with Thomas Nyfenger. Her early successes include winning the woodwind section of the BBC TV Young Musician of the Year competition and the Gold Medal in the Shell/London Symphony Orchestra Scholarship. 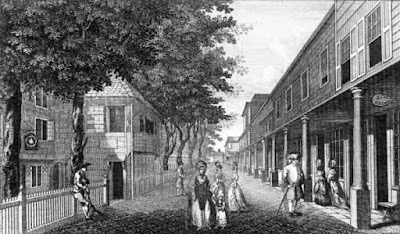 Whilst completing her studies in the USA, she was appointed principal flute of the Bournemouth Symphony Orchestra, a position she held for five years before returning to London. Karen is in great demand as guest principal flute with all the major London orchestras and ensembles including the London Philharmonic Orchestra, Philharmonia and London Sinfonietta. In addition, she is principal flute of both the London Chamber Orchestra and the City of London Sinfonia, and in 2014 was invited to play with the World Orchestra for Peace. She combines this with regular solo engagements, chamber music projects and commercial studio work including the film scores to Harry Potter, Sweeney Todd and Bridget Jones. Previously having held teaching posts at the Royal Northern College of Music and Trinity College of Music, London, Karen has a busy schedule as one of the UK’s leading flute teachers giving masterclasses across the country, as well as coaching for orchestras such as the National Youth Orchestra and Kent Youth Orchestra. In 2004 Karen became a professor at the Royal Academy of Music. 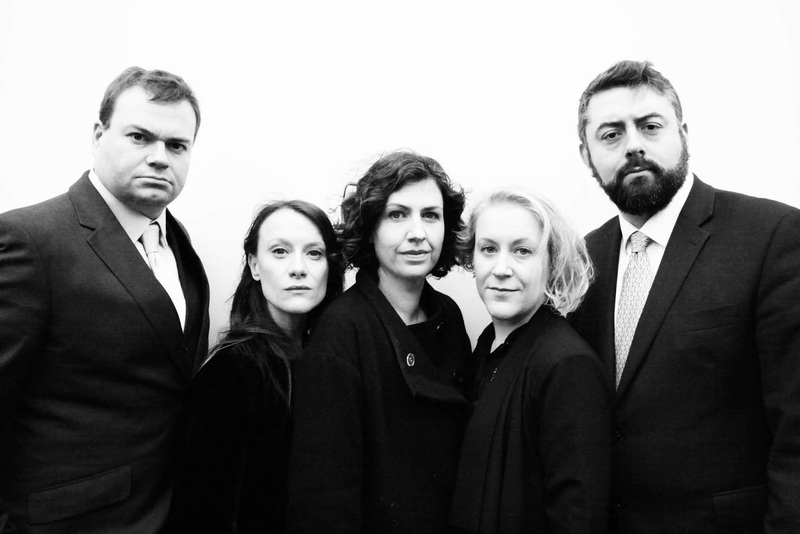 In partnership with the Tunbridge Wells International Music Festival, we present the Twilight Ensemble: singers Sarah Dacey, Ciara Hendrick, Greg Tassell and James Oldfield, and pianist Belinda Jones, with guest pianist Andrew Matthews-Owen. Highlights of the programme will include Brahms' Liebeslieder Waltzes Op. 52, and humorous songs by Tom Lehrer and Flanders & Swann. 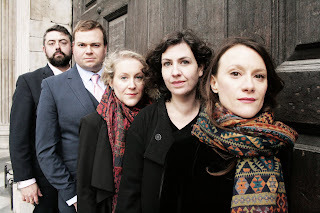 Described as 'exceptionally good' and 'full of personality' Twilight Ensemble have quickly established themselves as a brilliant vocal quartet group dedicated to performing a cappella and accompanied works. They have a wide range of repertoire, from rare French and German Romantic quartets through to light and comic songs, and have built an excellent reputation for their compelling sound, artistry and communication with audiences. Its members are outstanding singers and musicians, working regularly for companies such as the Royal Opera House, English Touring Opera, Glyndebourne, and the OAE and performing at venues including the Rachmaninoff Hall in Moscow, the Wigmore Hall, and Royal Festival Hall. As a group, they have appeared at a variety of venues and festivals including Brandenburg Choral Festival, Rye Arts Festival, Lamberhurst Festival, Queens Tennis Club and Drapers Hall, and have also recorded for Music Sales Ltd. As well as discovering and performing older works, the group are also dedicated to arranging and writing their own pieces and commissioning new works. We're delighted to announce the soloists who will be singing in our performance of Handel's Messiah on 8th December, directed by Steven Devine. We're delighted once again to join forces with the Tunbridge Wells International Music Festival. Download the flyer here or see the website www.tunbridgewellsfestival.co.uk. Here is our autumn concert listing for 2018. Tickets may be purchased from 1 August at www.ticketsource.co.uk/mkctw. There is normally a discount for booking in advance, and there is no charge to under-18s for most events. William Bass (cello) and Masahiro Yamaguchi (piano) perform music by Debussy, Stravinsky and others. Programme includes Rachmaninov's Sonata in G Minor for cello and piano. Twilight Ensemble: singers Sarah Dacey, Ciara Hendrick, Greg Tassell, James Oldfield and pianist Belinda Jones, plus guests, perform Brahms Liebeslieder and arrangements by Faure, Holst and Flanders and Swann, amongst others. In partnership with the Tunbridge Wells International Music Festival. Frisson: Karon Jones (flute), Ann Beilby (viola) and Hugh Webb (harp) with an enchanting programme of Debussy, Bax, Richard Rodney Bennett and others. Programme includes Shostakovich's second piano trio. Written in the midst of World War II, this work is an outpouring of grief for the death of his friend Ivan Sollertinsky and is the most heartfelt masterpiece of all of his chamber music. A devotional performance in place of the evening service to mark the centenary of the end of the First World War, with the King Charles Special Services Choir and the King Charles Singers. 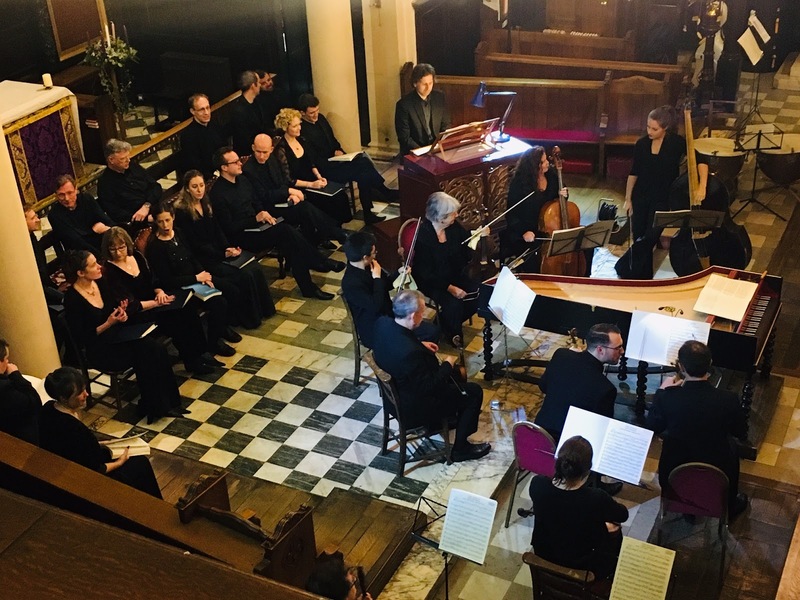 Four world-class soloists, with the Decimus Ensemble and the orchestra of Devine Music – principal players of the Orchestra of the Age of Enlightenment, The Academy of Ancient Music and others, directed by Steven Devine. This Christmas performance aims to capture the raw spirit and energy of Handel’s original conception by using forces similar to those he envisaged. 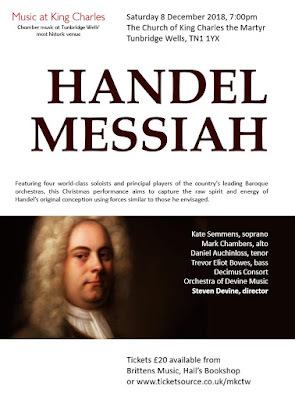 We're looking forward to another varied programme of concerts at King Charles this autumn, which will include top class chamber music as usual, both instrumental and choral, and culminates with a performance of Handel's Messiah on Saturday 8 December, which will be directed by Steven Devine. Along with everybody else this month, we've been tidying up our mailing list, and will be sending details of concert dates, and members' discounts, quite soon. 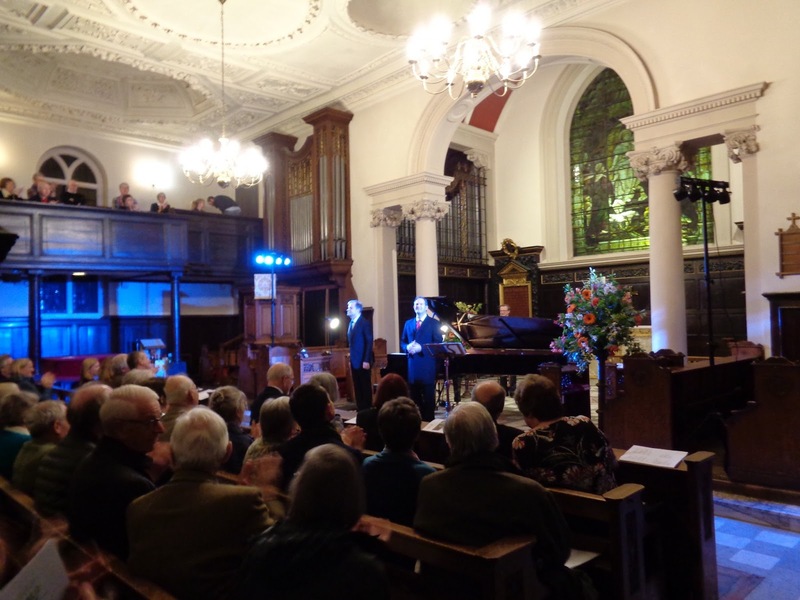 And we have news from our last concert, with Gerald Finley and Julius Drake - thanks to our generous sponsors and an enthusiastic audience, we raised over £2,000 for the Hospice in the Weald. 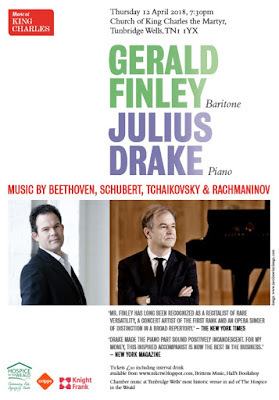 Canadian baritone Gerald Finley is joined by collaborative pianist Julius Drake in a stunning programme of Germanic and Russian art song. The first half focuses on Beethoven and Schubert settings of Goethe, including Schubert’s breakout version of “Erlkönig.” The second half features songs and romances of Tchaikovsky and Rachmaninov - literature that displays the beautiful traditions of Russian song-writing. All profits donated to the Hospice in the Weald. An interval drink is included in the ticket price. We expect to sell out and seating is unreserved so please arrive in good time. Directions, information about parking and venue facilities. Ken Aiso is internationally recognized as one of today’s most musical and versatile violinists. His playing is praised not only for his singularly beautiful tone, but also for the unique atmosphere of intimacy he evokes as he draws in his audiences. As recitalist and chamber musician, Ken has performed widely in Europe, the US and Japan with appearances at prestigious concert halls such as the Concertgebouw in Amsterdam, Wigmore and Queen Elizabeth Halls in London. In 2003 he was honoured to appear before the Emperor and Empress of Japan. In recent years, performing and teaching have also taken him to Georgia, Bolivia, Moldova, Serbia and Kazakhstan. Ken has been invited to renowned music festivals in Europe, India and Bolivia, and has been a faculty member at Montecito Summer Music Festival in Southern California since 2008. He is a member of Orchestra of the Age of Enlightenment, and has regularly appeared with Orchestre Révolutionnaire et Romantique, Mahler Chamber Orchestra and Scottish Chamber Orchestra, performing in all major concert venues in Europe and USA in this capacity. He was elected an Associate at the Royal Academy of Music in London in 2005. 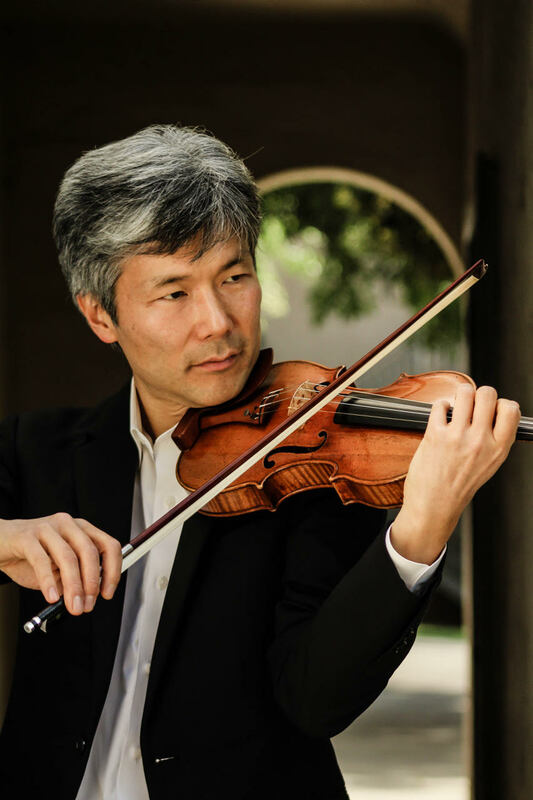 Ken is currently a teaching faculty of Violin and Viola at Loyola Marymount University in Los Angeles and La Sierra University in Riverside. He has co-founded Soundness Festival which brings awareness of classical music as healing medium, working with vibration in music meditation, singing and improvisation workshops. His work includes music at hospitals and institutions for special needs children. Sam Haywood has performed to critical acclaim in many of the world’s major concert halls. The Washington Post hailed his ‘dazzling, evocative playing’ and ‘lyrical sensitivity’ and the New York Times his ‘passionate flair and sparkling clarity’. He embraces a wide spectrum of the piano repertoire and is equally at home as a soloist, chamber musician or with accompanying Lieder. He has had a regular duo partnership with Joshua Bell since 2010 and often performs with cellist Steven Isserlis. 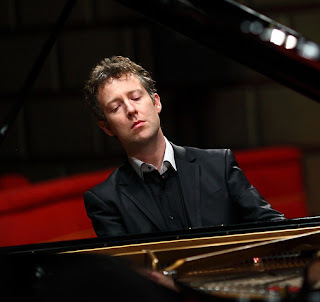 He has recorded two solo albums for Hyperion, one featuring the piano music of Julius Isserlis (grandfather of Steven Isserlis) and the other Charles Villiers Stanford’s preludes. His enthusiasm for period instruments led to a recording on Chopin’s own Pleyel piano. In 2013 Haywood co-founded Solent Music Festival in UK. The annual Lymington-based festival features highly varied programmes by internationally-renowned artists with projects in the local community. Artists have included the Bournemouth Symphony Orchestra, Alina Ibragimova, Mark Padmore and the Endellion Quartet. He was mentored by David Hartigan, Paul Badura-Skoda and Maria Curcio. Following his early success in the BBC Young Musician of the Year competition, the Royal Philharmonic Society awarded him the Julius Isserlis Scholarship. He studied both at the Universität für Musik und darstellende Kunst in Vienna and at the Royal Academy of Music in London, of which he is an Associate (ARAM). Haywood has written a children’s opera and is regularly involved in family concerts, workshops and master classes. He is on the roster of Musical Orbit, the online teaching website and his invention ‘memorystars®’ can significantly reduce the time needed to memorise a music score. His other passions include literature, physics, natural history, technology, magic, fountain pens and table tennis. Pre-Burns Night entertainment: concert by the St Andrews University Madrigal Group followed by a reception at 7:00 until 8:00. 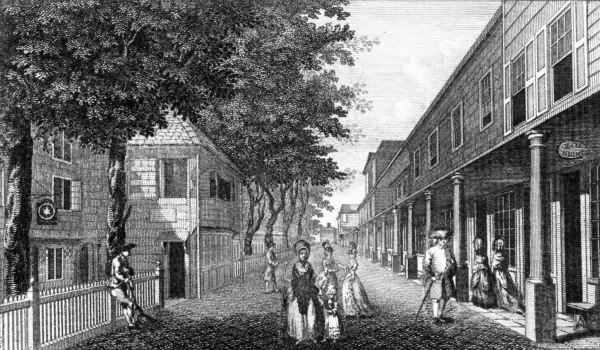 The St Andrews University Madrigal Group was founded in 1946 and although it originally conﬁned itself to singing madrigals and secular part songs, over time its repertoire has widened considerably, with a particular fondness for Scottish folksong as well as renaissance and baroque polyphony. Tickets available here for concert and reception with an early-booking discount. On Thursday 12 April we will have the exceptional privilege of a recital by the world-famous baritone Gerald Finley, accompanied by Julius Drake. Join our mailing list if you've not already done so to receive notification of discount tickets for this special event.